In these exclusive interviews for the Observer, I presented the story behind the case of missing marathon runner Mamie Konneh Lahun and highlighted the plight of Sierra Leonean athletes. 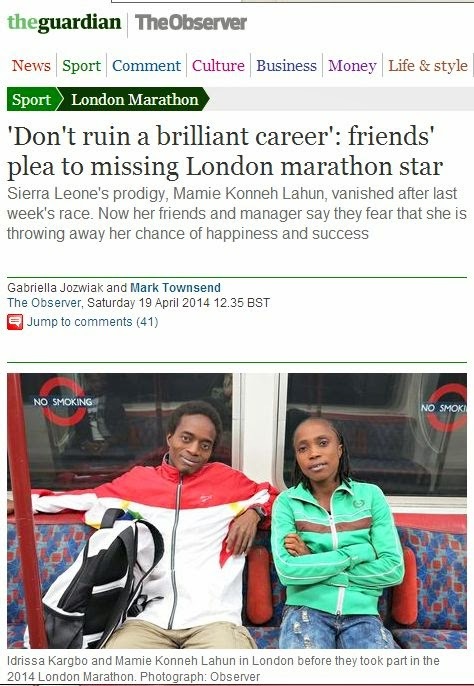 A week after Lahun disappeared following the London Marathon, I spoke to her manager and co-runner Idrissa Kargbo about the events leading up to the race and why she might have absconded. Their comments revealed the struggle athletes face in a country still recovering from a horrific civil war, and the commitment and talent they have which, if nurtured, could inspire a nation. Read the full article on the Observer website.